Our Wash Stations are designed to get your parts in and out, literally. Our open conveyor system is more efficient than other stationary hydrographic rinse tanks because it allows you to rinse products at a faster & more consistent pace. Other rinse stations require you to place a part, close the machine, and wait a designated amount of time before the next part can be washed. This prohibits efficient production and increases labor costs. 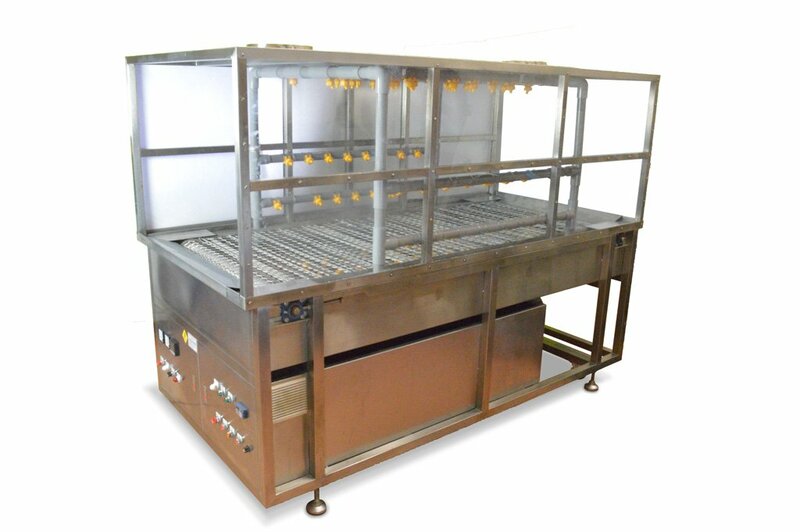 Our Wash Stations provide an efficient and effective solution to thoroughly rinsing excess PVA off freshly-dipped items. Large internal dimensions and a rugged Stainless-Steel conveyor suits all types of parts including large jigs and ATV components. 4-way headers use warm water to remove PVA. 2-stage wash system removes over 95% of residual PVA. Stainless-Steel wire mesh and chain are driven by a 1HP reduction drive motor. Speed controls and forward/reverse movement. Recirculation of water minimizes waste and reduces variable costs. 2 day Water Transfer Printing Training included. The final stage includes a manual wash wand that uses clean water supplied by an on-demand hot water heater to ensure 100% of PVA residue is removed. Internal Wash Zone Length (beginning nozzle to end nozzle): 108 in. Overall Canopy Length: 142 in. Internal Conveyor Width: 39 in. Internal Working Height: 32 in. Two-stage recirculating wash includes a 1-9KW heater and 1- 3HP self-priming, centrifugal pump. 21 in. of the exposed conveyor at the loading/unloading zones on each end allows for easy loading/unloading of fixtures by personnel or robotics. Internal Wash Zone Length (beginning nozzle to end nozzle): 55 in. Overall Canopy Length: 108 in. Single stage recirculating wash includes a 1-9KW heater and 1- 3HP self-priming, centrifugal pump. No exposed conveyor at the loading/unloading zones on each end. Whether you own a small hydrographics business or are a large-scale processor, every processed part must be cleaned to remove 100% of PVA residue. Our line of Wash Stations provides an efficient, effective, and durable solution to this time & labor intensive portion of the Water Transfer Printing process. Improve quality and reduce turnaround time with our lineup of Water Transfer Printing Wash Stations.